The WC X.21 LAN extender product offers a simple 'plug and play' method to extend a LAN connection between multiple sites using an X.21 leased line. The integrated 4-port LAN switch supports local switching, thereby removing the need for external switches or hubs in smaller LAN installations. The WC X.21 product has now been superceded by the more flexible MetroCONNECT: WC-Serial or the fully manageable MetroCONNECT WCM-Serial product which offers advanced functionality at a cost-effective price point. The WC X.21 is no longer available. Full wirespeed switching and filtering between the 10/100 BaseT LAN ports is supported so that only packets destined for the remote site are forwarded over the Nx64kbps leased line. In most installations the WC X.21 requires no configuration, and is therefore truly "plug and play". The subscriber ports perform auto-negotiation and support both 10M and 100M operation in full duplex (FD) or half duplex (HD) modes. Manual selection of 100M FD operation enables connection to fixed router ports. Cabling issues are minimised through the use of automatic MDI/MDIX selection on these ports. The highly efficient HDLC encapsulation of packets ensures that maximum throughput is achieved on the WAN link. Internal packet buffering enables each WC X.21 to smooth out bursty traffic without packet loss. The serial port operates in DTE mode, and requires the attached DCE (e.g. Kilostream NTU) to supply timing. The WC X.21 can also be operated in a dual-clock EIA530 mode to support asymmetric operation with an EIA530 satellite modem . An external cable can be used to convert the X.21 interface into EIA530 for connection to the satellite modem. The WC X.21 supports a maximum packet size (MTU) of 1536 bytes which is sufficient to transport double VLAN tagged frames (Q-in-Q). The WC X.21 units can easily be rackmounted in either a 1U two unit rackmount kit, in a 6U eighteen unit rackmount kit. This application shows two LANs connected together using an X.21 leased line, such as a BT Kilostream-N circuit. 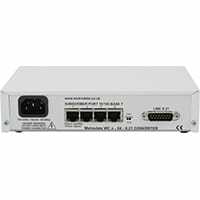 As a plug and play Ethernet switching device the WC X.21 is a straight forward and cost effective alternative to the use of routers in small and medium sized networks. This application shows two LANs connected together using a fractional E1 Nx64kbps G.703 leased line, such as a BT Kilostream-N circuit with G.703 connectivity. In this case the WC X.21 is used in conjunction with a DC3000 to interface to the leased line. As plug and play Ethernet switching devices the WC X.21 is a straight forward and cost effective alternative to the use of routers in small and medium sized networks. This application shows an Ethernet service delivered via an EIA530 satellite modem. In this application the WC X.21 supports local switching, wirespeed filtering and asymmetric data rates up to 20Mbps with an absolute minimum of overhead. This application requires another WC X.21 unit at the other end of the satellite link, and the use of a proprietary EIA530 to X.21 conversion cable.